The Hacketts are apart of the family that ended up in England with a name change, but they didn’t come directly from Germany, Instead, they went to the United States first, before following a job to London. Born in Berlin in 1899, Friedrich Hachenburg was an engineer and patent attorney who had been forced by the Nuremberg laws in 1933/34 to give up his profession and his partnership in the Berlin patent attorney firm. He was offered a job in a firm designing and building heavy machinery for the steel industry (it still exists today) based in Düsseldorf managed (and largely owned) by the Czech-German-Jewish businessmen. My mother, Lotte or Charlotte, – a Grunebaum and thus through her mother, Agathe, a Hirschland – met my father, either through friends or her parents who lived in Düsseldorf and in due course they became engaged. During that period, life became more difficult and they decided to emigrate, initially to the USA, where they married in December 1937. 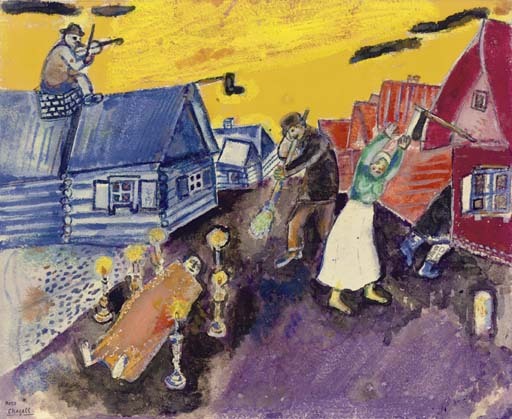 According to family mythology Franz (Hirschland) gave them a choice as a wedding present, either a check that would cover their honeymoon in Florida or a Chagall gouache. They had both just arrived in the States with even less money than most young married couples – my father was hunting for a job and my mother for her part was working in the rag trade in New York to keep body and soul together. They naturally chose the check (even if in later years they may have regretted their decision). Not only did Franz and Gula give them a generous check but Franz also lent them a Pontiac convertible. They had a great time until it came to driving back to New York. The car hadn’t been very reliable during the trip but near the city, it had a major breakdown and my parents had to use what remained of the proceeds of Franz and Gula’s check to fix the car. The result was that they spent the last night of their honeymoon in some flea-bag of a hotel in NYC. In the meantime, the owners of the company where my father had been working in Dusseldorf considered that life there was likely to become unpleasant for them as Jews, in spite of the protection of their Czech citizenship, and moved with a few key employees to London and set up again as heavy machinery designers and builders. They offered my father a job and so he and my mother moved back across the Atlantic in early 1938. Later that year, Ernst and Agathe Grünebaum, went for a short visit to visit Lotte in London, and ended up staying, with only the things they had brought for that short visit. (There are some whispers about the family having “tricked” them into this move. — Victoria) It was more than a year before they were able to receive their furniture and other belongings. (See Ernst Grunebaum’s Memoirs, published privately by the Grunebaum family). Ernst and Agathe settled near their daughter. Early on in the war, my father was interned as an “enemy alien” — a fate suffered by many German Jews in the UK (rather similar to that affecting Japanese Americans after Pearl Harbor). Fortunately, he stayed on the UK mainland (some were interned on the Isle of Man and others shipped across U-boat-infested seas to Australia and Canada — a policy reviewed after the “Arandora Star” disaster) and was released after about six weeks, allegedly after his employers argued that as an engineer he was needed for the war effort. So fortunately, unlike many of our parents’ friends, lawyers or in finance — professions not needed in a nation at war — my father was in a so-called “reserved” occupation. During the war, my brother Peter Paul was born (1941) and I followed a fortnight after the war ended. My father’s name was Hachenburg and even after the war was over, anything sounding German was unpopular. There was also an under-current of anti-semitism which, if never overt in the UK, was far more prevalent than today. Even in the early 1950’s, my brother, Peter Paul, suffered bullying on that account. So after becoming His Majesty’s naturalized subjects in 1947, our parents resolved to crown their Anglo-assimilation by changing their name, not for the same reason as the Hannams, but because they were fed up with giving explanations about their origins. They also wanted to help us, their sons, in our own futures (a bit like the Harveys). Ironically, Peter Paul’s eldest son, Yohanan, has reverted to Hachenburg because it is quite common to have a German-sounding name in Israel. Our father continued with the heavy-engineering firm until retiring in 1964, after which he joined a firm of patent attorneys for another twelve or so years, until in his mid-seventies ill-health forced him to cut back. He died in 1980 a few weeks short of his 81st birthday. Our mother, the daughter of Ernst and Agathe (née Hirschland) Grunebaum had died in 1957, so it was our father as a single parent who brought us up, with the support, moral if not financial, of the extended Grunebaum family). Peter Paul went on to become a neurologist and emigrated to Israel in 1979. Encouraged by our American family, I followed the family banking tradition beginning in 1968 with S G Warburg, an investment bank in London whose Hamburg forebears were friendly competitors of the Simon Hirschland Bank in financing the German economy. I joined the European Investment Bank in Luxembourg in 1981. It is a European counterpart of the World Bank. On “retirement” in mid-2010, I am following my father’s path in carrying on working but from London (with the European Bank for Reconstruction and Development, concentrating on E. Europe and Russia), although I doubt if I’ll carry on as long as him.